TPC Overall Rank: #343 out of 2933 rides. User Tracker Count: 281 times. This is the best of the Disney Orbits. This one stands tall above the rest of Tomorrowland and needs an elevator to access the platform. I love this ride. You get some great views and cool off. Pretty fast and high for this type of ride. Lines can get pretty long but definately ride it if you have some time. Surprisingly fun, perhaps because it spins faster than the other Dumbo-like rides. Astro Orbitor is a great ride that can be enjoyed by people of all ages. The rockets are high off the ground so riders can see view most of the Magic Kingdom. Having the wind fly into your face as you soar through the sky is a fantastic experience that everyone should relish in during their stay at Walt Disney World. Ever dream of flying a spaceship high above the ground? I sure did as a kid, and for a long time Astro Orbiter would be the closest I would get to fulfilling the dream. 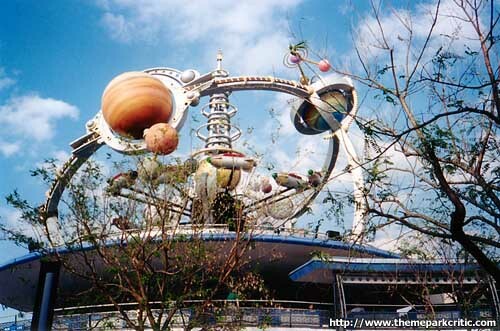 Since then far more technologically advanced attractions like Mission: SPACE have been able to create a far more realistic effect of space travel, but nonetheless Astro Oribter is a Tomorrowland staple. Located high above Tomorrowland perched atop a futuristic building, Astro Orbiter is definitely appealing to the eye with its soaring rockets and dazzling planetary ring around the structure. But as great as it looks during the day, it looks even better at night with the lights on, illuminating the rockets in an eerie green glow. Unfortunately though like Dumbo, Astro suffers from a really low capacity leading to somewhat lengthy waits for such a simple ride that usually reside around 20-40 minutes. Really the experience begins with a quick elevator ride to the top to board one of the various rockets. While it seems like a simple touch, there’s just something about the added height of the attraction that just adds to the overall aura of the attraction. Once the ride itself begins, I could easily control the height of my rocket to get some outstanding views of the park, especially of Fantasyland and Tomorrowland. Just the feeling of being way up off the ground is achieved wonderfully and it really seems like you’re up way higher than you actually are. Really my only complaint with the ride itself is the cycle, which is definitely on the short side. While not nearly as short as Dumbo, it definitely leaves a lot to be desired. 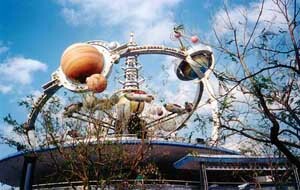 In a region rich in these Roto-Jet style attractions, Astro Orbiter gets the dubious honor as the best of the bunch in my opinion, just narrowly edging out Island of Adventure’s creative One Fish Two Fish for the best of the genre. Astro is undeniably a quite enjoyable attraction that provides a neat little twist on a classic attraction. So why just a 3? Well two things hold it back. One, the short cycle. Two, the wait. I definitely recommend giving Astro a ride while at the Magic Kingdom, but if pressed for time, it is skippable since it really is nothing more than a glorified Roto Jet-style attraction. This ride is a big suprise. When I was little I always forgot this ride because I thought it was like Dumbo(i was 9 then). Now I am 15 and I rode it for the first time. It was pretty cool. When you go all the way up it tilts. It looks like you might run into something or fly off. Great view of the castle. Alot better than Dumbo. Not a 10 to the really boring long line. I enjoyed this ride. It seems a lot higher than it really is once you get up there. You get good views of Magic Kingdom and if youd rather not go that high you dont need to. Lines can get rather long though. This is a fun ride that kids and parents can enjoy together. It gives a good view of the park and its really high. I enjoyed the music also. Youd expect more from Disney than just going around in circles in rockets. Oh, and its way outdated. They should update it, or replace it altogether. Then again, you get a pretty good view. A good ride but not exceptional. This ride usually has long lines as a price for its interesting location. This ride however gets a 9 for the cicumstances when i rode it. I rode this ride with my 2 year old brother who loved it during the Wishes fireworks show which made him really excited.